When I started my little blog 2 years ago, I wasn’t sure what direction it would take or how personal I’d get, so I decided to use a cover name for David, you know, to protect his identity. But a lot has changed since then. My modesty has been thrown out the window. People know who David is (sorry, babe!). And perhaps the biggest change of all since I began blogging? David has started drinking green monsters… on purpose. His one stipulation is that he doesn’t want to see what goes in it. I can deal with that. 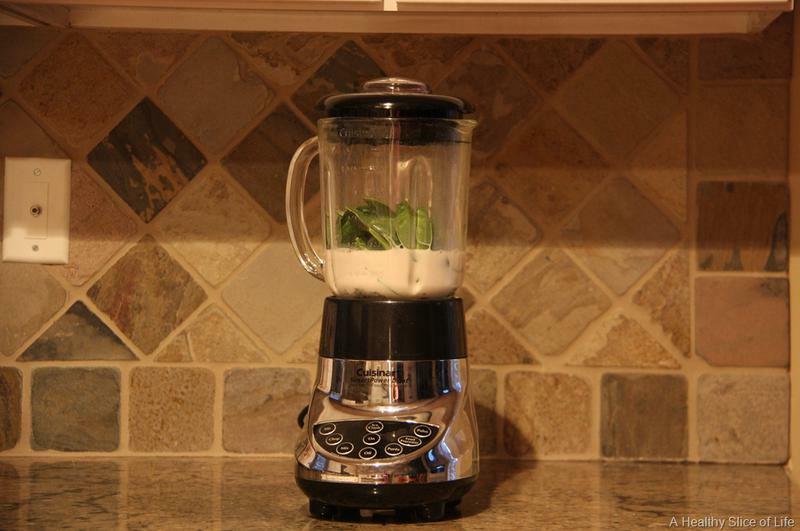 It means that the smoothie TASTES good, “despite” it’s healthy ingredients. Well, let’s hope he isn’t reading this because I’m showing you what goes in this man-friendly health drink. Directions? Put it all in the blender. Smile because your loved one is drinking a salad for breakfast… and liking it! At around 430 calories, it’s a perfect blend of carbs, fat and proteins for breakfast. And the best part? It’s freaking delicious. What’s your favorite green monster combo? That is my PB of choice as well! My green monsters (that Vishnu has come to love as well) usually consist of almond milk, a frozen banana, chocolate protein powder, PB, instant coffee, and spinach. YUM. I loved that post of Katie’s. I’ve stopped using emoticons since reading it (that was the one thing I was guilty of) and literally every night have to force my fingers away from the colon & parentheses keys while I’m writing my posts. It’s so hard but I feel like the humor actually comes across more pointedly without them. Anyway…love green monsters. 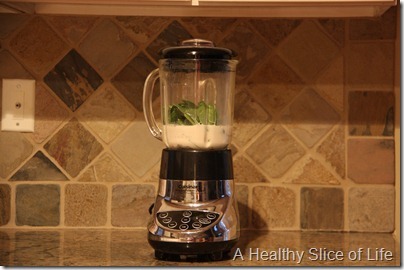 I usually just do some combo of spinach + berries + yogurt + protein powder + milk. I tried giving up emoticons and it almost physically hurt. I’ve decided that it’s part of what makes me, me and to go on without my 😉 🙂 and 😮 faces just wouldn’t feel right- haha. I love green monsters! My fav is spinach + almond milk + frozen banana + ground flaxseed meal. I’m still working on getting my hubby to try one. Loved this! That last picture totally looks like he is in a commercial. For the record, I like the faces, but I am pretty cheesy. Have a great day! I have green monsters several mornings a week, and my fav combo is frozen strawberries, half a frozen banana, frozen pineapple, ground flax seed, kale or spinach, and a big scoop of vanilla protein powder. I made my parents try it while they were visiting, after they turned their noses up initially, and they actually admitted that it tasted good. Success!! The chocolate amazing grass powder is my favorite! We (my 2 & 1/2 year old and I) had green smoothies this morning with coconut milk, banana, frozen kale, cocoa powder and vanilla. I added the amazing grass to mine after his was served. Ironically enough, my husband is named David and will totally drink a green monster if I make it for him. He will even admit they are delicious! I had one this morning with leftover chocolate milk from last night’s dinner (I got too full to finish it), baby spinach, peanut butter (Skippy natural all the way), banana, and lots of ice. Yummy! I’m so used to you calling him Hubbs, and think it’s funny when you call him David. Mostly because my boyfriend is David. 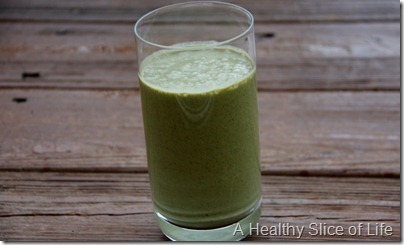 I like spinach, coconut milk, banana, mango, and pineapple in my green smoothies. 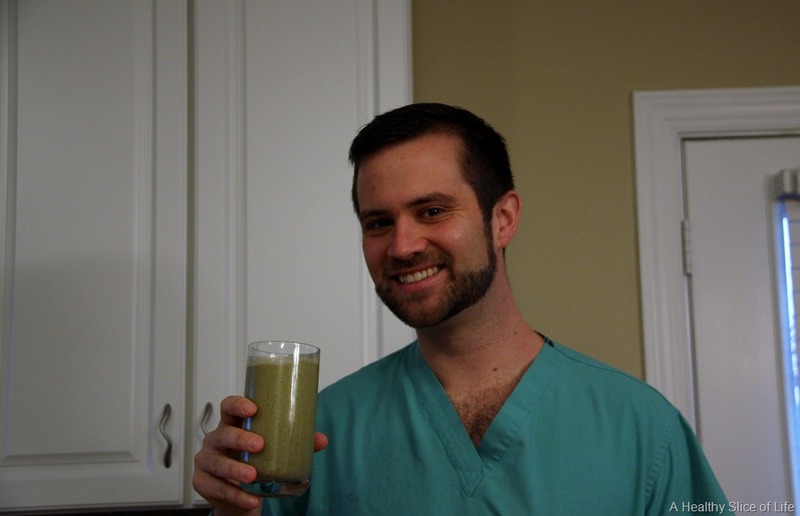 My husband loves green smoothies as does my 3 year old. I think I am going to start making a baby version for my 6 month old, the pediatrician thought it was a good idea since my baby hates eating off a spoon! I will just sub breastmilk in for the almond milk since i have about 400 oz in my freezer to use up and a baby who refuses to take a bottle! You have 400 oz saved up?! Holy moly! yes and thats after giving 150 oz to a friend who couldn’t breastfeed. Looks like I may be giving her even more soon! I have an overproduction to say the least, I could easily pump twice what I do, but since its a supply and demand I only pump when I need pressure relief! I like mine with spinach (obviously ;))blueberries and raspberries, milk, vanilla protein and some orange juice to sweeten it right up!! haha – I loved this. My husband REFUSES to drink anyting green. And I still refer to John as “the Husband” because it’s more fun and stories are much more hilarious that way. I’m all about making people giggle. 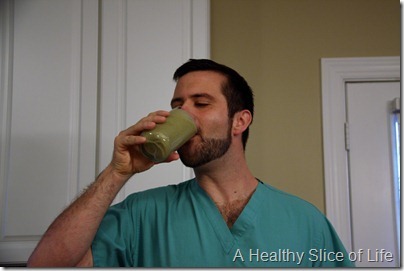 My husband gets hyper over green smoothies. It’s actually hilarious to see him get all bulgy- eyed when he sees me taking out the blender. Btw, I was wondering if Gibbs works in the health care system. Funny that I know you meant to type Hubbs, because my phone always auto-corrects Hubbs to Gibbs, too 🙂 Yes, he sells medical devices, so he spends a lot of time in the hospitals! yay for hubbys drinking greens 🙂 i’m writing a post similar to this right now!! My husband is the same way, he’ll drink them, as long as he doesn’t know what’s in them. 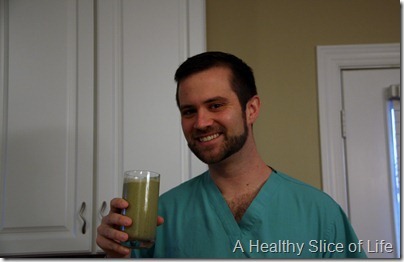 HAHA…my husband won’t drink green smoothies either. I keep telling him they taste exactly the same as what he’s having but he just doesn’t buy it. We always add plain green yogurt for some added protein and thickness and also use unsweetened almond milk (vanilla flavor is great) since it has no added sugar! 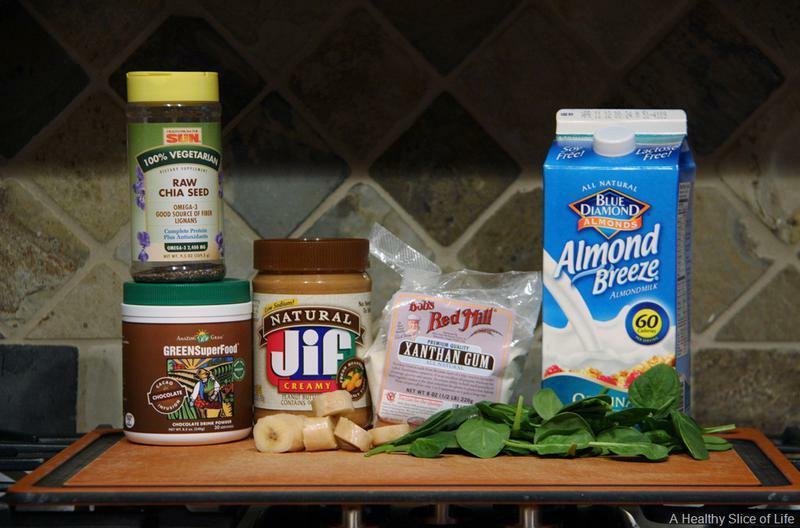 1 frozen banana, 1-2 tbsp pb, 1/2 cup almond milk, handful of spinach, and a few good shakes of cinnamon! 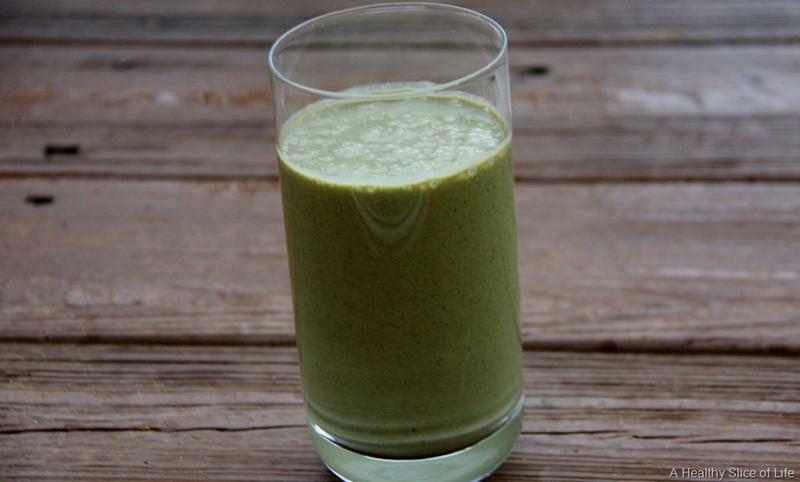 Hmmm…your Green Monster Smoothie recipe sounds great! I will definitely be trying this one for my husband. I like adding apple slices (with the peels) to my green monsters because they add a refreshing sweetness. I love the video of H singing! Too cute and getting to be such a big girl sitting in the cart! We’ve been to Big Daddy’s and didn’t love it, but heard so much about it that we has to try it out! Good work on sticking with your pescatarian diet over the weekend. Can’t imagine that was easy!